U.S. Food and Drug Administration (FDA) Commissioner Dr. Scott Gottlieb announced plans to advance a Notice of Proposed Rulemaking to ban menthol in combustible tobacco products, including cigarettes and cigars, and remove certain flavored vaping products out of stores where young people can access them. The FDA, in partnership with the U.S. Centers for Disease Control and Prevention (CDC), released new findings from the National Youth Tobacco Survey showing that more than 3.6 million middle and high school students were current (past 30 day) e-cigarette users in 2018, a dramatic increase of more than 1.5 million students since last year. According to the results published in the Morbidity and Mortality Weekly Report, youth who use e-cigarettes also are using them more frequently and using flavored products more often than last year. According to the findings, the number of U.S. high school students who reported being current e-cigarette users increased 78 percent between 2017 and 2018 to 3.05 million (or 20.8 percent). Numbers among middle school students rose 48 percent to 570,000 (or 4.9 percent). The sharp rise in e-cigarette use has resulted in an increase in overall youth tobacco product use, reversing a decline seen in recent years, and is prompting a series of steps by the FDA to curb youth use trends. 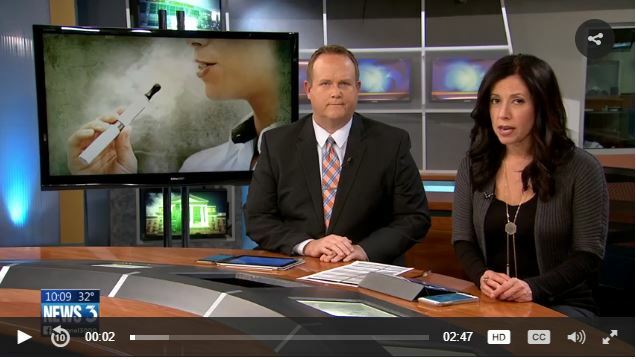 The CBS News affiliate in Madison, Wisconsin spoke to UW-CTRI Clinical Services Director Dr. Doug Jorenby about the FDA proposals to ban menthols in combustible tobacco products and curb availability to some flavored vaping products where youth can access them. Under the FDA’s proposed rule, vaping devices—such as e-cigarettes that look like combustible cigarettes, JUUL devices that resemble flash drives, and larger “tank” devices with refillable liquid cartridges—in flavors except tobacco, mint and menthol, would be restricted to stores that have an adult age requirement to enter. The proposed policy would apply to flavors such as cherry, bubble gum, mango, vanilla, crème, tropical and others. Online sales would be restricted by age with heightened verification security. JUUL and Altria Group have announced plans to comply. At this time, vaping products with tobacco, mint or menthol flavors, as well as any non-flavored vaping products, sold in any location, would not be included in any policy revisions. Gottlieb said the proposal recognizes that combustible cigarettes are currently available in menthol in retail locations that are not age-restricted, and is informed by the potential public health benefit for adult cigarette smokers who may use these vaping products as part of a transition away from smoking. While Gottlieb said the FDA would “accelerate” these proposals, definitive dates were not announced. To read more about vaping, JUUL and e-cigarettes, click here.